At the weekend hubby and I had an outing to Keswick. I have already written about it in a post (with my first slide show ever) on my words and pictures blog. 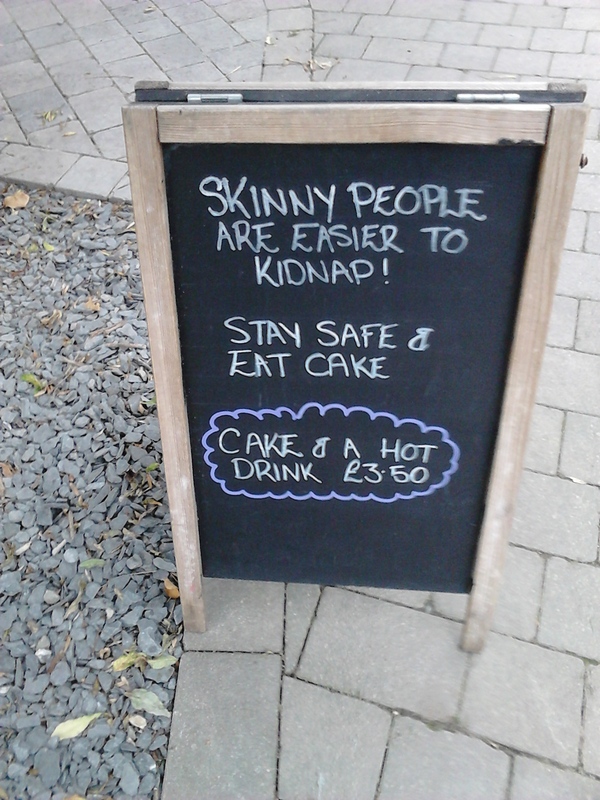 As we were approaching Hope Park I was stopped in my tracks by what I read on a blackboard outside a café. Amusing signs have long been a source of inspiration to photographers or snappers up of unconsidered trifles. I don’t know where the author of this one found inspiration. I am still telling my friends about it. There was a mystery at the same time that I noticed the sign. A busker had disappeared. I hope he was simply eating cake and that it was nothing more sinister. In other news I completed a coat and larger bonnet and bootees using the pattern featured in an earlier post. For any knitters, who might be interested, I have a few hints and tips. I used circular needles (one at a time, working backwards and forwards) for most of this project. The coat is knitted in one piece to the armholes and the stitches fit more comfortably on an 80cm circular needle than on a pair of knitting needles. 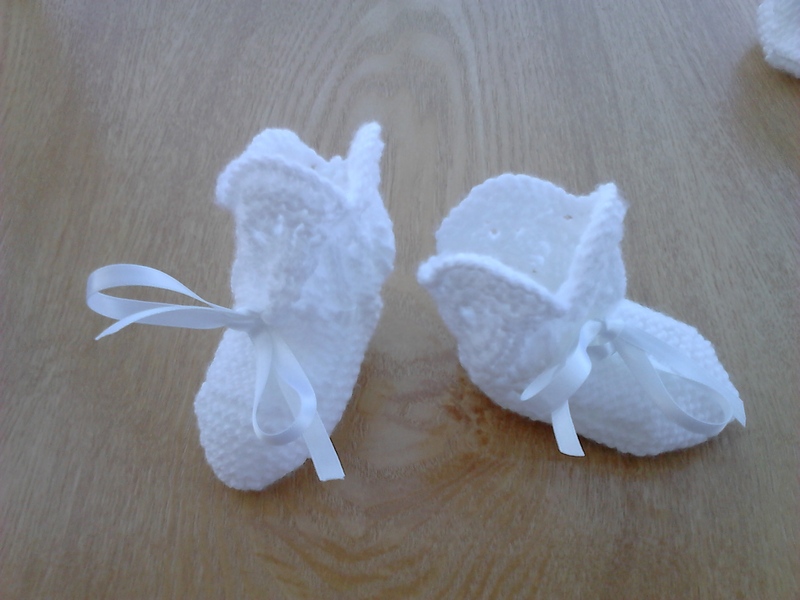 It also helps for bootees as the stitches, which need to be held, while the instep is being knitted remain on the needle. Ordinary knitting needles might be OK for the sleeves, but the yoke is best on a circular needle. Finding somewhere without shadows to take the photo of the coat was a problem. In the end I found a bright spot with uniform shade! I had a really useful idea this week, when I tried on a pair of trousers to adjust the fit. As I was going to put extra elastic inside the waistband, I put the trousers on inside out. It was then easy to pin the elastic in place. Perhaps I need a sign. Danger radiation hazard – brainwaves! Have you seen any funny signs or had any good ideas recently? My latest knitting project is from a modern pattern, the first I have purchased for several years. It is Peter Gregory designs for knitting 685 with a link to www.ukhandknitting.com on the cover. There is an interesting blog on this website, which is currently being reconstructed. 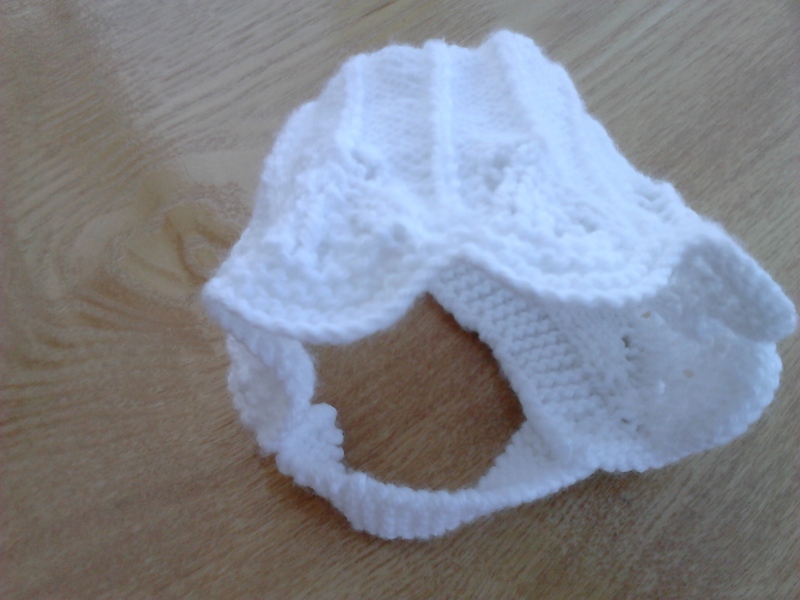 I have substituted WonderSoft by Stylecraft baby double knitting as it was the only suitable yarn I could find locally. I am now knitting the coat, which requires 235 stitches for the largest size. Although I have been a lifelong knitter, I still have difficulty counting stitches. 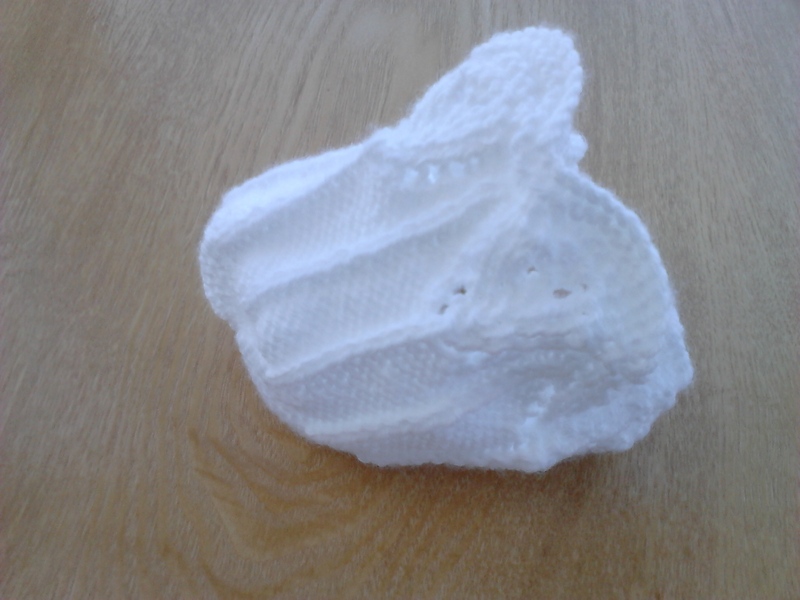 I count the stitches I have just cast on two or three times and arrive at a different total each time! For this project I am using a circular needle and knitting backwards and forwards. I realised that I could reduce the number of stitches I need to count all at once by dividing up the work using safety pins. I used a safety pin after each 100 stitches, but it would be easier to use one every 50 stitches. I am also checking that each pattern row is correct as I go along. Usually I press on regardless and then having to unpick (frog) inches of knitting! 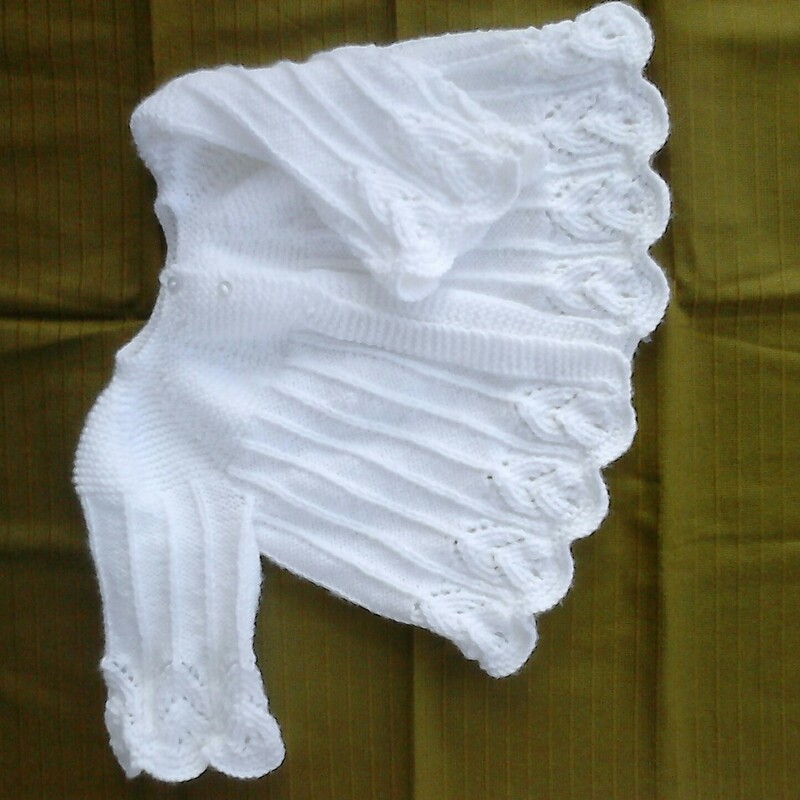 This pattern gives four sizes for a dress and a coat and two sizes for the bonnet and bootees. I managed to reach a straightforward section of the coat, where the pattern is similar to the sides of the bonnet, so that I could knit at craft group without making lots of mistakes. How often do you think, why ever didn’t I think of that before?